The Cefas Fish Health Inspectorate (FHI) have recently produced a new guidance leaflet “Koi herpesvirus disease and your fishery”. The leaflet is intended for carp fishery owners, is available to download from the Angling Trust, and is reproduced here. Don’t hesitate: it is a notifiable disease in the UK and you have a legal obligation to report any suspicion of a KHV outbreak to the Fish Health Inspectorate (FHI) immediately (01305 206700). As water temperatures rise in the summer, anglers and fishery managers must remain vigilant to the threat of koi herpesvirus (KHV) disease. If carp are dying, their gills look pale or rotten, and the water temperature is over 16˚C, then it might be KHV. 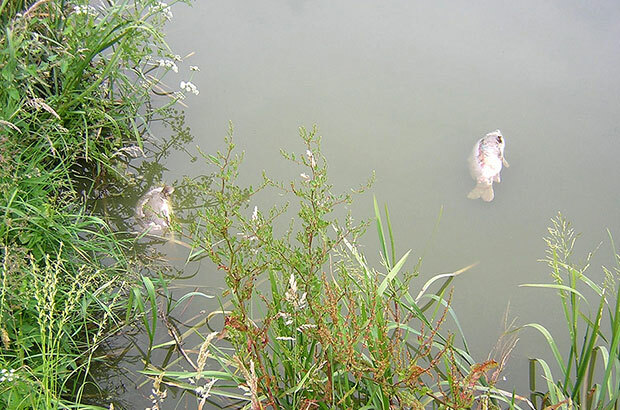 Is it mostly carp dying while other species are unaffected? Is it summer, with water temperature above 16°C? Are the fish displaying clinical signs of KHV? Lethargy, “hanging” in the water, gathering at water inlets or points of aeration. Although such fish superficially appear similar to basking fish, sick fish won’t “spook” away as vigorously as a healthy fish, if at all. The mucus covering the skin can appear as if flaking off, making the fish feel dry and rough when handled. There may also be secondary infections caused by parasitic, fungal or bacterial pathogens. 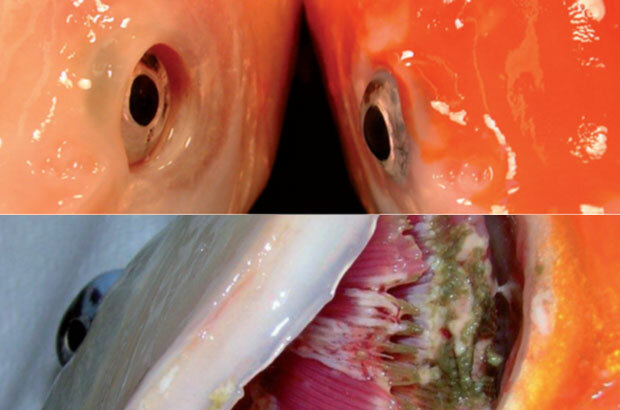 An example of gill damage in a KHV infected carp, and a carp with a sunken eye. When I report it, what happens? The fishery won’t be forced to close permanently and the remaining stock won’t be culled - unless the fishery owner decides to do so themselves. The FHI will investigate and place specific control measures to contain the virus in affected waters, and prevent further spread. Prompt action will protect the rest of your fishery and other waters. If KHV is suspected or confirmed, then the FHI may temporarily close the affected water. This is to reduce stress on the fish and allow them to recover. Specifically the FHI stop the movement of equipment on and off the affected water whilst the mortalities continue. Equipment movements are allowed on any unaffected waters, but biosecurity measures (such as net dips) will be set up, if not already in place. When mortalities have stopped, disinfection facilities must still be maintained and used by anglers when leaving the fishery. Ideally, the fishery would supply their own nets, mats and slings for use on the affected site only. The FHI will place movement controls on the fish: restricting movements into, within and out of the fishery. After a fish mortality, the temptation is to restock with new fish to replace those that died. However, KHV can be carried by survivors, so carp can’t be stocked until after the following summer and only if there hasn’t been a second outbreak. FHI permission must be obtained for all fish introductions. New fish may contract the disease from the survivors of the initial outbreak, and even after one year there is no guarantee this won’t happen. How did it get into my fishery? The most likely route of introducing KHV is through live fish movements of infected animals. This includes introductions of unwanted pet koi or ghost carp, and carp from other fisheries. The rehoming of pet koi into fisheries is illegal and poses a high risk of introducing KHV disease. The virus can also be transmitted via nets, mats and slings. Anglers moving from one water to the next with wet slimy equipment kept in “stink bags” are a proven risk. Can I treat my fish? There is no treatment for KHV. Also any fish that survive the disease may carry the virus and act as a source of infection. This means that fishery management and biosecurity are key to managing the stock after the outbreak. How do I reduce the risk of getting it in the first place? Carp may have already been exposed and carry the virus. Go and inspect a stock before purchase, research your supplier online, and speak to other fishery owners. Find out the stock’s origin: is it a farm or fishery? You can also identify sites on which KHV has been confirmed. Fisheries should supply their own nets, mats and slings. This will be a running cost, but budget for it via fees or take deposits. The cost of replacing stolen or damaged nets won’t be as much as losing and replacing all your carp. Install equipment disinfection points where you can, and maintain and use them. Encourage anglers to come to your site with clean and dry equipment. You can’t rely on others to protect your fishery. You must do it yourself. Fisheries in Australia are wanting to release it here. Bad news for the ornamental koi industry. Experts might want to consider the potential devastation caused overseas.